Even if you live in France and are a huge fan of fast food and Star Wars, you'll probably still hate these new burgers. Even though nobody in their right mind should be even remotely excited about Lucasfilm's upcoming re-release of The Phantom Menace, there's a ton of new merchandise/marketing deals coming out that's tied to the film. However, George Lucas has pretty much admitted that he's willing to slap his brand's name on just about anything, thanks to the Star Wars fast food burgers that have just been revealed in France. 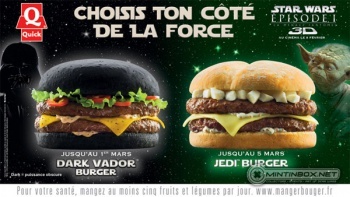 French fast food chain Quick has unveiled its "Jedi," "Dark" and "Dark Vador" burgers. The ad for the Dark Vador and Jedi burgers can be seen here and - let's be honest - they look disgusting. The Dark Vador has a black bun, while the Jedi features ... well, they look like marshmallows, but they're probably just poorly-presented onions. The Dark burger, meanwhile, looks like it might have a reddish bun, but I'm not sure how much of that is the glow-y red Sith effect of the ad. The Star Wars empire is no stranger to crazy merchandising, and the Episode 1 re-release is clearly unafraid to whore itself out, but George Lucas may have just outdone himself with these. I guess we should count ourselves lucky that we didn't get a Gungan burger.